Walking into 313 – the newest mall on Orchard Road – we stumbled upon Honeymoon Dessert on the fourth floor just below the Food Republic. Attracted by the beautiful photo slideshow of traditional Chinese desserts with a modern twist, we decided to give the place a shot. Both the mango pomelo sago and the grass jelly in red bean soup with green tea ice cream were recommended, having thumbs up signs on the menu. These were excellent choices as they were extremely flavorful and fragrant in both taste and smell. The watermelon bean curd dish was tasty but I felt like it didn’t quite compare to the others. It still tasted fresh and light though, which was exactly what we were looking for. 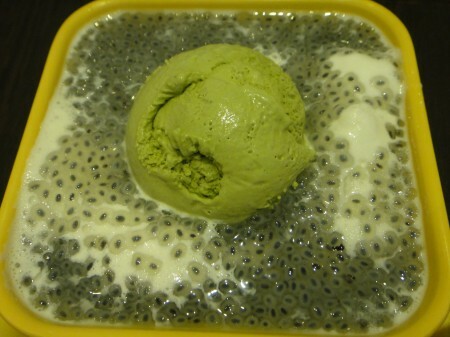 Before ordering the mango pomelo sago dish, I had had my eye on the basil seed in vanilla sauce with green tea ice cream – it was actually my second choice! As one of the individuals I was with was planning on ordering it anyway, I figured I could get the mango pomelo sago and get a taste of the basil seed at the same time. Honeymoon Dessert has interesting and uniquely Asian sweet items that I haven’t seen anywhere else – check out the menu picture for an idea of what they offer – especially eye catching is the Ying Yang type pudding pictured. Definitely going to miss this kind of stuff when I get back to Montreal! Tags: Bean Curd, Dessert, Green Tea, Ice Cream, Ion Orchard, Jelly, Mango, Pomelo, Red Beans, Sago, Singapore, Watermelon.